Prime Minister Narendra Modi has won the online reader's poll for TIME Person of the Year 2016. NEW YORK: Prime Minister Narendra Modi has won the online reader's poll for TIME Person of the Year 2016, beating world leaders like US President-elect Donald Trump, incumbent US leader Barack Obama and Russian President Vladimir Putin. Modi won the poll with 18 per cent of the votes when it closed Sunday night, getting significantly more votes than his closest contenders, including Obama, Trump and Wikileaks Founder Julian Assange, who all received 7 per cent of the 'yes' vote. Modi was also overtook other prominent figures of 2016, like Facebook founder Mark Zuckerberg (2 per cent) and US Presidential nominee Hillary Clinton (4 per cent), Time said. Time's editors will decide the winner later this week, but the poll results provide a glimpse of how the world sees these figures, with Modi emerging the most influential in 2016. Time said the reader poll is an "important window" into who they think most shaped 2016. 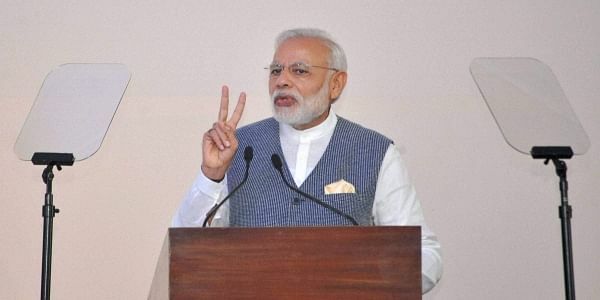 It is for the second time that Modi has won the online readers' poll for the title, having secured the honour in 2014, when he garnered over 16 per cent of the almost five million votes cast. This is the fourth consecutive year that he is among the contenders for the honour, which the US publication bestows every year to the one "who has most influenced the news and the world in the past year, for good or ill". German Chancellor Angela Merkel was Time's 'Person of the Year' 2015. Time said that, Modi had, in recent months, seen high approval ratings from Indians, according to a September Pew poll. It added, however that he was under scrutiny recently for getting rid of 500- and 1,000-rupee notes, impacting cash-based businesses and threatening India's economy. Current poll results, analysed by poll host Apester, found that preferences differed across the world and the United States. Modi performed particularly well among Indian voters as well as those in California and New Jersey. He had been in the lead in this year’s online poll and according to the initial votes cast, he had got 21 per cent of the votes. For a while Assange had overtaken Trump for the lead in the online poll, getting 10 per cent of all the "yes" votes cast by participants, Time had said. Time also analysed moments from 2016 when this year's contenders were most talked about. For Modi it was October 16, when the Indian leader had suggested during a summit of BRICS nations in Goa, that Pakistan is the "mothership" for terrorism.